Over the past few months more and more students have been having the same issue at the dog park. They go to visit with their friends, and the dogs are brought along for some social time and exercise and the next thing they know is that Fido is rolled on his back squealing or maybe he is doing the rolling. Most often the problem is quickly resolved by the dogs themselves, but sometimes, things go wrong and a dog gets injured. Why are so many of my students having trouble in the dog park. In a word “toys”. Or more properly, toy. If you have six dogs in the dog park who know each other, but not well and one person brings a toy into the dog park, then chaos often ensues. Six dogs and one tennis ball, heck TWO dogs and one tennis ball, is a recipe for problems. Dogs have rules of possession on the scale of a toddler. “If I see it, it’s mine. If you had it, and I want it, it’s mine. If you had it and you dropped it by accident, and you still want it, it’s mine. If I had it before but lost interest and now you have it, it’s mine. If you look at me and then glance at it, it’s mine.” Add in a hapless human throwing it, and you have a true constellation of events that will create the perfect storm. Most dogs like toys, and toys are a wonderful relationship building tool to help people and dogs play together. Toys with a group of puppies can work really well. Toys with a group of adolescent dogs and their people means that one dog wins and the other dog looses, and unlike a game of Monopoly, the stakes for winning and losing may be much greater than you imagine. One ball and multiple dogs sets the dogs up to fall into one of four categories. The first category is the dog who doesn’t care. He may run along with the gang chasing the toy, but he really doesn’t care about the toy, the game or what the other dogs desire. This dog rarely gets in trouble unless his person decides to teach him to care about that toy being thrown; then he may shift into another category. As long as he doesn’t care though, he runs along on the outside of the group, not really focused on the toy itself, just enjoying the run with the rest of the gang. The second category is the dog who is really, really fast. This dog can run into behavioural difficulty in two scenarios. The first scenario is when he is small and fast enough to challenge a larger, predatory dog. As he passes his rival, the rival slips into a behaviour called predatory drift. Predatory drift is a behaviour that starts out as parallel running play, and morphs into predation as the arousal increases. This is most common in small dog/large dog pairings where the small dogs gets up a head of steam and outruns the larger dog. The larger dog initially starts to try to keep up, but if his arousal goes up quickly enough and high enough, he becomes predatory and may side swipe and grab the smaller dog. In extreme cases, a perfectly friendly larger dog can kill his closest buddy! The second really fast scenario is when the really fast dog comes into the fray and becomes the target of one of the nasty dogs. Nasty dogs in this case may be perfectly nice dogs until challenged in some way, in which case they reach for teeth first and ask questions later. Often these dogs started out as fast dogs but were repeatedly thwarted by a faster rival. They care about the toy being thrown and they work hard to get to it, and if another dog looks like he is going to get ahead and win the ball, he will do what he needs to do to stop that from happening. The final category of dog is the strong dog. This dog often lags in the back of the running group but once the toy is procured by a fast dog he walks in and strong arms his way into possession of the item. This dog may not be fast, and he isn’t interested in a fight along the way; he is strong enough that he is able to wade into the middle and take the item out of the other dog’s mouth. The strong dog will sometimes take the ball or kong or frisbee, lie down and begin to chew. He is confident that he will be able to keep that item and chase isn’t his game. Chase is just the predictor of getting the item! It can almost look like he is depending on a fast do to get the item for him. Like Calvin from the comic strip Calvin and Hobbes, when Mo the bully shows up, Calvin (a fast dog) just gives up his lunch money (the item) to Mo (the strong dog). This dynamic plays out over and over again when you have multiple dogs and few toys. Even with two dogs and one toy, there is no guarantee that you will avoid bullying, predation or aggression. 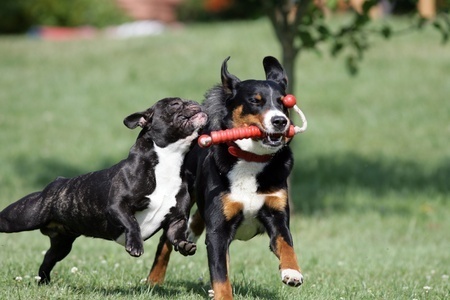 Two dogs will usually come to an agreement about who gets the ball or toy, and both may play, but it is rare that both dogs enjoy the game as much as they would if it were just you and one dog playing fetch. Bear, our first Chesapeake was raised with a littermate. I got to see them with a ball precisely once. The ball was thrown, his sister shot ahead and he trotted slowly and sadly behind. She had been very, very clear that toys were NOT his for fetching! When we later tried to teach him to fetch, he was very, very reluctant to the extent that he would not fetch if another dog was watching. Another aspect to the dog park and toy dynamic is when an owner brings a toy, and wants to engage with his own dog in a game, and there are other dogs in the vicinity. Then the owner gets bent out of shape when a faster, stronger or nastier dog takes over the toy and the owner adds to the tension by getting angry with the other owners in the park who don’t “have control” over their dogs who were playing quite happily until the person with the toy showed up. So how do you play with one toy and multiple dogs? I would suggest that maybe you don’t! When I have worked with multiple dogs, and retrieving, it sure didn’t have the feeling of play. What I do when I want to do retrieving and I only have one toy but two dogs is that I work on turn taking; a skill that will set dogs up to succeed. One dog does a down stay and one dog fetches the toy. Then the dog who fetched does a down stay while the dog who stayed gets his turn. If you do it often enough, it makes sense to the dogs, but it is a long haul to get to that point. Many dogs hate being the dog who is in the down stay and get highly aroused when it is not their turn. I have worked with groups of dogs each of whom carries his or her own toy and sometimes they bring the toy to a person to throw. 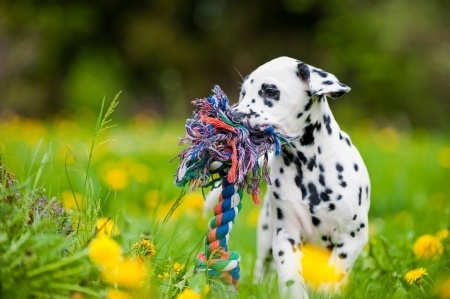 In this case, with everyone with a mouthful of toy, the dogs don’t seem to chase as a group and if a second dog goes after another dog’s toy, often the first dog will pick up the toy that the second dog drops in the process. This is really only a suitable solution if you have a stable group of dogs who know one another and who are all willing to carry their own toys. Even then, I like to carry extra toys with me so that I can hand them out to dogs who drop their first toy. Most folks have probably seen multiple dogs playing with one toy. When people aren’t involved, there is a very different dynamic. I often see dogs on trail walks pick up a piece of garbage or a stick or even a feather and play canine keep away with one another. Rarely does this go wrong because the dynamic is much closer to what dogs naturally do! The fast dog may be the one who initiates the game, and if he is smaller than the other dogs, he is rarely targeted because the object of the game is to get the item from the faster dog, not to chase the item jointly with the fastest dog winning. 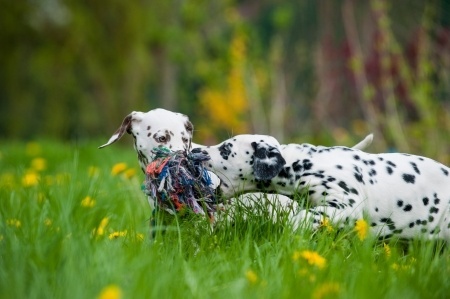 Another common dog initiated game is tug between two or more dogs. 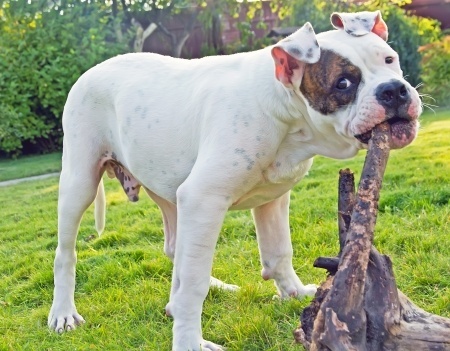 Strong dogs often suggest this game, finding a sturdy stick and offering it to the other dogs. A faster dog may join in and if the stick breaks, he may then initiate a game of keep away. It is not uncommon to see smaller dogs and larger dogs playing this with great vigour, and even groups of dogs playing this game together. The key here is that the dogs sort out on their own how things work out. They aren’t being ramped up by having the item go faster through human intervention. If they do catch sight of prey and hunt it, the dynamic is much different than it is when a human is orchestrating the activity. Hunting is a chance encounter between a prey species and the dogs, where retrieving is a wholly artificial activity involving intense focus on the human who throws and then competition instead of co-operation towards the goal. In domestic dogs, hunting is not usually successful either, so there is no end winner or loser. The prey gets away and the dogs go back to what they were doing. When hunting is successful, in my experience most dogs drop the prey and then try and elicit movement from it by using play bows and by darting in and leaving. Many of the “I don’t care type of dogs” seem to be partnered with people who think that they must encourage their dog to participate, and if the dog participates and then gets frustrated, he may fall inadvertently into the nasty category; he didn’t want to play to begin with but now that he is playing he wants to play by his own rules. Encouraging play in dogs who don’t want to play can lead to disastrous results. It is really important that when you take a dog into a social situation, you respect who the dog is and support him in interactions that are fulfilling to that particular dog. Toys can be a great tool for people to use to help dogs to interact with them; they are the props that form the activities that we do together. A ball can be a retrieving prop, or a searching prop or even just something that the two of us hold onto together. Toys work well when there is one dog and one person. They also work well when there are lots of toys and dogs but no people. Where there seems to be problems is when one person has one toy and there are many dogs, some of whom want the ball and some of whom get bowled over in the fray as the fastest, strongest or nastiest dog takes control over the ball and then an argument breaks out over who should have control. The solution is actually pretty simple; when you go to the dog park, bring your dog and leave your toys at home. People who bring toys to dog parks are the bane of my experience there. Granted, it’s my own dog that is often the problem, but there never is a problem until someone throws a ball. Why don’t these parks work on a booking system, where friends /groups who know their dogs can be together, having fun or training in a safe fenced area. If I had the where with all to open one in the UK I would run it on a locked /card gate system and have it booked it by the hour by an App so a dog who is faster, resource guarder etc and can be a problem can have his games with an interactive owner or a housemate where boundaries are already established, or a have a hooley on his own, without fear of injury or upsetting other owners. Unfortunately, the reality here in N. America is that most dog parks are barely-tolerated-by-the-general-public, mostly-ignored uses of city tax dollars. I am thrilled to find shade, much less any more advanced conveniences. Not that I’m bashing all dog parks. There are a few places here and there that provide not only plenty of shade, but also drinking water, agility courses, water features and so on. Some of those even understand that small dogs should have their own space, and that some people want their dogs in the water and others want it fenced away from the area where they take their dog. I fear implementing your idea, even in just a section of the overall parks, would be way more time and trouble than a city government would want to take on for what is often a very controversial resource.